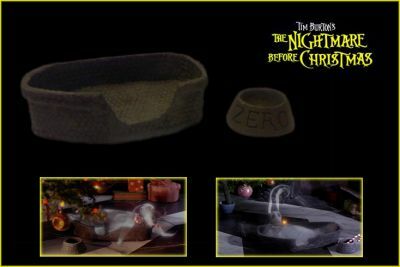 This is Zero's screen used dog bed and bowl from the Tim Burton animated classic "The Nightmare Before Christmas". Zero; Jack Skellington's infamous sidekick, helps Jack through the fog in Christmas town with his bright pumpkin nose (designed after Rudolph). These pieces can be seen numerous times throughout the film including the scenes inside Jack's house when he is trying to figure out what makes Christmas.